Rain's Garden: Sleepy Dogs and "Cheese"
It was raining this morning, but it didn't stop me from having coffee on my lovely porch! :) The dogs wanted to be with me so we all found some room. They doze off so quickly, I wish I had that gift! 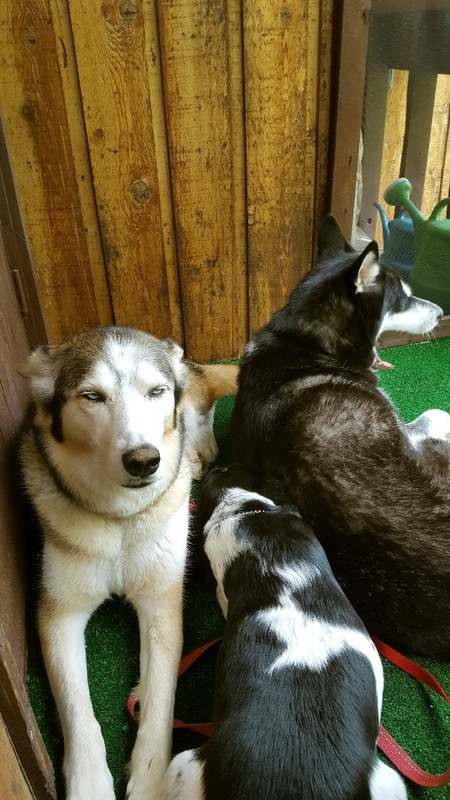 Marlene, bless her heart, tries so hard to stay awake...Jack found a cozy spot between the girls and Charlie fell right to sleep after that big yawn. It was so nice and relaxing! After coffee, I headed out to the thrift store and scored! I got 26 nice big containers for $15 that will house all of my plants. They look practically new, what a great find. They look like they came right from the Dollar Store actually. I was debating that...since my ban on the Dollar Store this year...but I was also wondering how I'd afford all the containers I will need in the next month so I relaxed my rule a little bit! I also scored on some garden soil/compost mix, 99 cents for a bag of 25 liters. I got an abundance of it, my car was tilted backwards it seemed when I drove home! Whatever I don't use now, I'll definitely be using in the fall for my winter garden. So Alex and I are continuing to eat very well, no processed stuff at all. He's sticking to his herbal regime and is doing very well now. 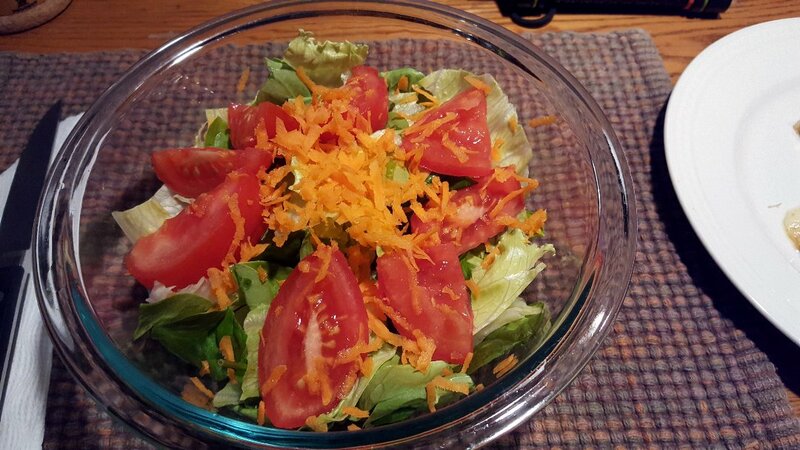 We are enjoying salads every night with dinner. But we wanted to try some of the old dishes again. I decided to make a small portion of my Papas Fritas since we had some leftover Cracker Barrel Monteray Jack in the fridge. This was the wee portion I made, we shared it. Since neither of us has had cheese in over a week, we were curious to see how we'd handle it. Well, it digested okay, but this "cheese" didn't taste like CHEESE anymore. So sad. Everything from the grocery store is subpar. Alex and I are cheese-ADORERS...we both came to the sad realization that this stuff is just crap. 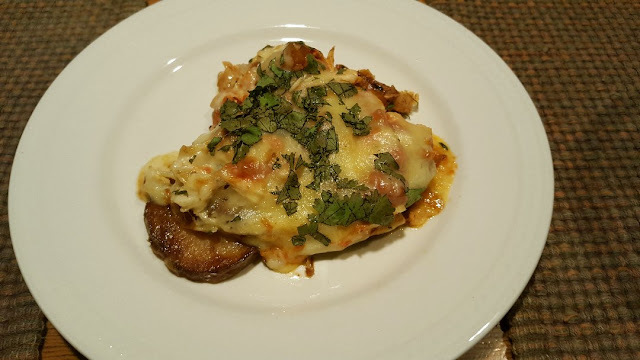 I mean, the meal is healthy with potatoes, salsa, fresh cilantro and chicken...but that "cheese" didn't cut it. We made the big decision that we will only buy REAL cheese from now on...nothing pre-packaged at the grocery store. We'll just have to alter the recipes to have less of it because real cheese is mucho expensive! Until the day comes when I don the hat of Cheesemaker, we'll have to enjoy the good stuff less often! Cheese is one of those things I am willing to pay good money for. Real cheese is a treat. Glad to hear Alex is feeling better. Oh wow! Your porch is amazing, you must be sooo proud :D Your garden is looking lovely too and your seedlings have really thrived. I've been wearing myself out in my garden too. I have the lawns to cut, which is always left to last as I just don't enjoy it! So here we all are, trying so hard to eat real food, only to discover that the stuff we've been used to all along is really quite blah when it comes down to it. Sad but true! I see other commenters are suggesting you make your own cheese - it's true it's easy (sort of), just don't use ultrapasteurized milk. The high temperature changes the structure of the protein so that it won't form proper curds. Not sure you're ready for that but I had to mention it! the dogs are too funny. i wish i could fall to sleep quickly like teddy too! i am lucky to have an excellent cheese store here where i buy all of my cheese. I miss my dairy goats. I would make my own cream cheese, fromage blanc, ricotta, etc with it. I just don't have the time to own some again. I don't like to use much cheese, mostly Parmesan and organic cheddar. I have a cheese making kit which I have not delved into yet...it seems by the time I get my daily chores done I don't have the energy to start something new so now I will do my 'big rocks first', priorities, because I run out of steam otherwise! LOL! So cute how the dogs all want to be by you even if they have to squeeze in...they are awesome! Fake cheese is bad and so is fake crab meat...ugh! Yes, I would do without rather than eat that...so sad as you made such a nice dinner. I am reading a book about a family who ate 'real food' for a year and what they came up with as far as recipes and what they learned. I'll post about it as she started out blogging about it and it is still out there in her blogs. I don't know how pioneers did it all....of course, they didn't have television or the internet! LOL! Isn't it true that, once you move to 'real' food, everything else resembles wallpaper paste? I make an easy cottage cheese (ala Mama Pea) that I eat a lot of. I am lucky in that my Jersey, Jasmine, is just down the road at my neighbor's dairy farm. He milks her and I benefit. Woot! Love the sleepy dogs - mine are the same way when it rains. What a score for pots and soil! The cheapest soil I have found is 50 L for $6.99. Not that cheap. And I need A LOT for my potato bags, topping up all my other garden needs. But what fun its going to be! I really want a cheese making kit for either my birthday or Yule! That way I can try to make my own and actually taste what real cheese tastes like. I hope your weekend is lovely and the weather is fantastic! I like Thrift Stores. I've gotten lots of good equipment and other supplies from them. We have six good stores in my county and the four counties next to us. Hi Dawn :) I love goat cheese. We have that often here and I hope one day to have goats of my own too. 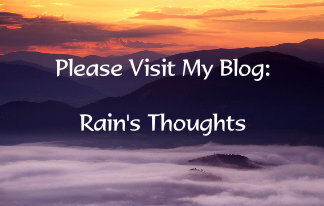 I'll be posting photos of those containers when I transplant the veggies, right now they are being poured on by rain! Hi TB :) So you're a cheese maker? That's great! So far I've only made ricotta, but I really want to try my hand at all sorts of cheeses in the future. Hi Nik :) Lol..that is exactly it, we taste the plastic it's wrapped in now. We ate so much of it before that after a week's break, our palate's are more sensitive. You'll be getting more goats soon! I thought Tillie was a milking machine! Hi Yarrow :) Thanks for the well wishes! :) Yes, I'm super proud of my porch! 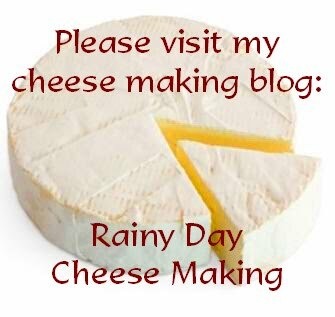 :) I have been looking up simple cheeses to make, I need to find some rennet and try it out. My goal one day is to make really aged cheeses too, and some Bries and Camemberts...that would be so amazing! I'm honestly surprised at how the seedlings shot up so wonderfully, what a great motivator! Hi Joyce :) Your Teddy is adorable. The dogs have such a great ability to sleep soundly all the time...lucky them. I also have a great cheese shop, but it's about an hour's drive away. I usually go on my monthly shopping trip and try to stock up, but they only sell in bulk and sometimes not in the budget. But we're shifting things around so we can buy some good cheese, just less often now. Hi Kristina :) I can imagine how much time it takes to own cattle, above everything else you do. We use a lot of fresh Parmesan too. But so much of our favourite recipes call for cheese, so we have to find another solution. Hi Susan :) Yes, wallpaper paste, though I've never had the pleasure of eating that lol...I wish I had access to fresh milk. There really aren't any farms close to where I live. I should do a little more research about that. I'll have to check out Mama Pea's cottage cheese recipe! I hope you get your cheese making kit! :) I'm going to do some research...I want to try at least to make some good Mozzarella, we eat so many pizzas and things that call for it. I kind of see what you mean about chicken. I found the same, but since I started to bake it in foil in the oven, I find it's super moist so I have no problems! Hi Harry :) I love Thrift Stores too...we have about 4 of them in neighbouring towns. It's just getting there that is a little hassle at times because none of them are very close by. Whenever I'm out though, I stop by and always find some kind of good deal! Hi Nancy :)) Thanks, I'm definitely enjoying everything I have right now :)) Hope you are too!